Make your bachelorette party a memorable bonding experience for you and your guests to enjoy and talk about for years to come. An experienced instructor will guide your guests through a beginner-friendly and body positive aerial arts class with a healthy dose of fun and photo ops! Your unique event will include a T-shirt for the bride, a group photo op with fabrics, and a surprise non-alcoholic aerial toast at the end of class. 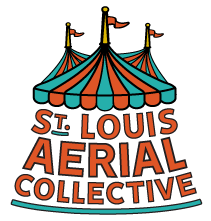 We will make your event at St. Louis Aerial Collective a highlight of your wedding week! Arrive 15 min early to check in. Ages 13+. All guests must sign online waivers in advance. Students must be fully sober; please save that kind of partying for after your aerial adventure. All genders are welcome at our bachelorette parties. $100 refundable deposit secures your reservation.